CHASSIS FEATURES REAR SUSPENSION » The linkage rear suspension with WP shock absorber was reworked for MY2013 for all models. Beside some weight reductions of bolts, bearing cups and washers of the link­age system the settings of the shocks have been completely updated. In addition the 350 SX-F is fitted with a harder spring. Of course it is KTM standard to a low individual clicker adjustment (rebound and high/low speed compression damping) for any kind of rider and race track. SWING ARM » Aluminium cast swing arm provides perfect stability at minimum weight. 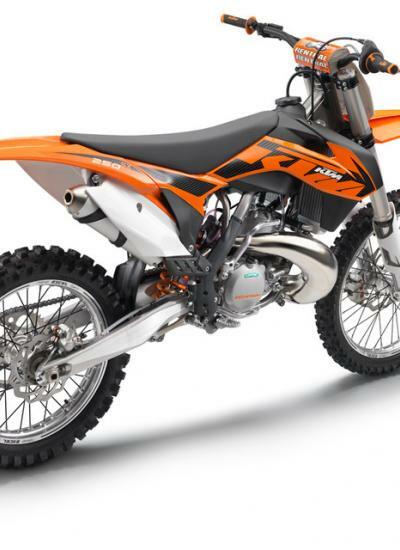 For MY2013 the swing arm is reinforced and now allows the mounting of a larger rear axle to work together with the new frame concept for improved riding stability. FRAME » Modern and lightweight frame design made of chromoly steel provides optimal mix of stiff-ness and flexibility for maximum track stability, easy handling and precise cornering. 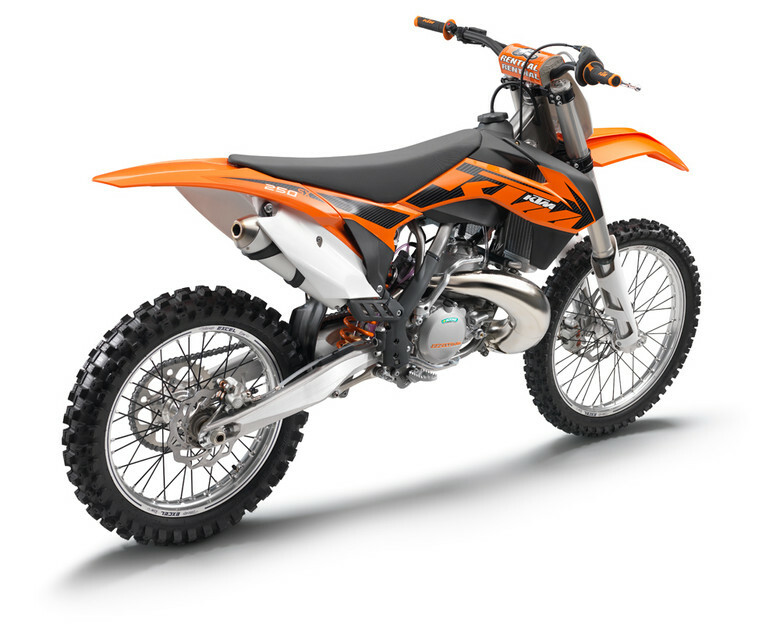 BODYWORK » After just two years the bodywork is completely reworked to further improve the bike ergonomics and indicate clearly, that model year 2013 means a new generation for KTM SX. FRONT SUSPENSION » The further improved 48 mm WP closed cartridge Upside-Down fork shines with completely reworked settings for all models and harder springs for 250 and 450 SX-F. A newly developed fork oil provides reduced friction and improved durability for more constant damping characteristics during its entire life cycle. FUEL TANKS » The 7.5 litre fuel tanks have been reworked for 2013 to match the shape of the new spoilers for improved ergonomics. In addition they feature a new inner screw-type fuel cap. TRIPLE CLAMPS » Further developed CNC machined triple clamps improve the bike´s stability and provide improved fork clamping, supporting the fork action due to reduced friction and better bending characteristics. In addition the lower clamp features a weight reduction of 80g due to the reworked design. The front fender is attached by two screws on the bottom and two in the front. AIRBOX » Newly designed airbox and cover provides more space for the TWIN AIR filter. New intake snorkels for all 4-stroke models allow for better airflow and higher performance. The exchange of the airfilter is possible without any tools in just a few seconds. The airbox cover features standard clips to be fixed, optionally it can be secured by an additional screw. WHEELS » High strength EXCEL rims, CNC machined hubs and new spokes coated in black guarantee maximum stability. The Pirelli Mid Soft 32 tires stand for outstanding traction. A stronger rear axle (20 >25 mm) improves the stability of the bike. HANDLEBARS » All models are fitted with new 827 Renthal Fatbar handlebars featuring the equivalent bend of the 996 Twin-wall. New 2-compound grips with KTM logo provide excellent contact to the bike. EXHAUST SYSTEM » Future noise limits will be a real challenge for every manufacturer, therefore KTM put a lot of effort into developing new exhaust systems for all 4-stroke models, which meet the tough limits of the 2013 season and even improve the bikes performance. COOLING SYSTEM » The proven cooling system is transferring the cooling liquid from the cylinder through the frame triangle to the new WP radiators. BRAKES » The proven Brembo brakes in combination with the WAVE discs and stainless steel brake lines provide the best brake performance. The rear caliper carrier is adapted to the larger rear axle. GRAPHICS » A completely new graphic design in conjunction with the new bodywork is a clear statement to underline the performance of the new SX generation. ENGINE REED VALVE » A new V-Force 4 reed valve block provides smoother power delivery and performance and guarantees better reliability of the reeds. DDS CLUTCH » The new 250 SX engine is fitted with a new DDS clutch (Damped Diaphragm Steel) featuring a CNC machined one-piece clutch basket combined with the primary gear made of high-strength steel. It allows the use of thinner steel linings, which makes the whole clutch package noticeably lower (- 5.5 mm) and reduces the weight by 250 gr. A diaphragm spring reduces the lever force needed to activate the clutch and makes it possible to implement an additional rubber damping system for better traction and more reliability of the transmission. The Brembo hydraulic system secures a controllable modulation of the clutch.